Back in 1974, I wrote my first book “Time, Cost & Architecture” (McGraw-Hill 1975) in which I described a way to achieve more effective time/cost control through better design and construction management methods. Several days ago my colleague Ennis Parker sent out a message informing people about the publication of my second book “Bridging: A Construction Project Delivery Method” (available from Lulu.com), which some have stated to be the logical “evolution” of the concepts I set forth in my first book. In the days following Ennis’ announcement we have received a considerable amount of interest in both the new book and this blog, and one of the more amusing responses was “What took George so long?” – a great question! In retrospect, I realize that I’ve been writing this book for nearly twenty years; a great deal of the text inside the new book has been gathered from material that I prepared for my staff and other architects and program managers to use when carrying out projects under Bridging. 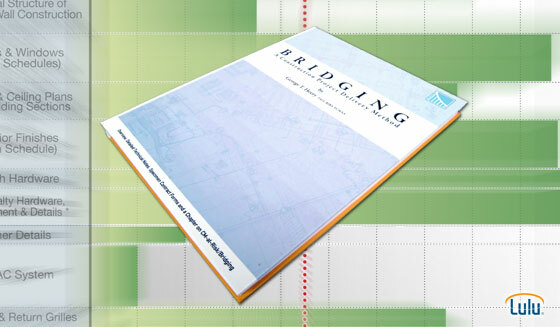 I feel that it’s become imperative for me to share these guides with other professionals because while the use of Bridging is becoming more and more popular, I have observed several instances in which owners and architects have failed to achieve the benefits available through Bridging simply because they had not followed the correct procedures and methodologies. Instances in which professionals fail to properly execute Bridging projects troubles me and I felt compelled to “protect” the tenets of Bridging by creating an authoritative reference, hopefully dispelling any lingering misinformation. Two of the most common errors? Using improperly prepared Bridging Contract Documents (“Bidding documents”), and the premature loss of leverage for the Owner. In Bridging, the drawings and specifications that the Owner’s Design Consultant (sometimes referred to as the “Bridging Architect” of the “Design Architect”) are prepared as major parts of the Bridging Contract Documents (“BCDs” or “bid documents”) for a design-build form of contract. These drawings and specifications are referred to as the Design Guide Illustrations (“DGIs”) and the Owner’s Minimum Requirements (“OMR”). Yet, while it’s true that the preparation of the DGIs and the OMR requires about the same level of effort in preparation as would the traditional DD documents, the DGIs and the OMR are very different indeed from DD drawings and specifications. This difference makes them highly enforceable in the contract between the Owner and the Contractor under a design-build form of contract, which is certainly not the case with DD documents. Unfortunately, there have been cases in which designers did not understand the crucial distinction between Bridging and the traditional method and attempted to use traditional “DD” documents as the basis for receiving the “bid” (or contract price negotiation). Clearly, not understanding this and not following proper procedure for the preparation of the DGIs and the OMR are a very serious mistake because properly prepared DGIs and OMR are highly enforceable used in conjunction with a Bridging version of a Design-Build Contract, while traditional Design Development documents are not very enforceable. After the two-step design-build form of contract is awarded to the successful proposing Contractor (which has it own architects and engineers as subs or members of its organization) only the preparation of the final Construction Documents is first authorized. Following proper Bridging procedures, upon completion of the CDs by the Contractor’s AE and payment for that level of work is authorized by the Owner’s Design Consultant and/or Program Manager, the Owner has the right to terminate the contract without cause. 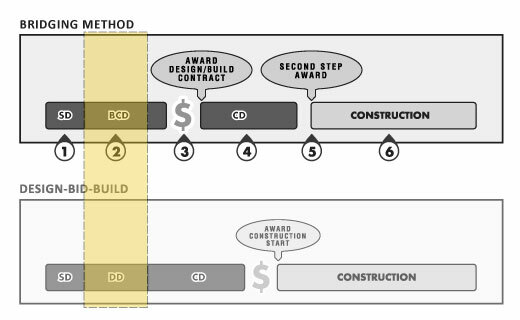 This right retains important leverage for the Owner, which, by the way, is the same point in the project sequence as the Owner would have in a traditional design-bid-build or CM-at-Risk project and is much later in the project than the Owner would typically loose it leverage in a typical Design-Build contract. I thoroghly enjoyed reading your book “Bridging: A Construction Project Delivery Method”. I also enjoyed our conversation last February 2014 regarding the questions I presented to you that you referred me to Joel Neal, Director of Planning at Cal Poly San Luis Obispo, to answer. I plan on calling him this week as advised and if you like, I can respond on your blog so that others can share in his answers to my questions.